I have another Polish Con polish to show you today! My friend Jess was kind enough to pick this up for me in September at PC and I'm sooooo lucky she did! 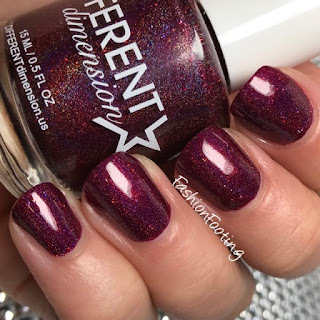 Different Dimension Whatchu Talkin' Bout Willis is a deep berry holo with holo glitter. I love the addition of holo glitter in holos that I'm seeing lately; it really adds something to the polish to make is sparkle even more! This was 2 coats, plus topcoat.